OMG! Here's an amazing noise damaged/punk compilation featuring some of the best bands of the genre. Learning Curve records did this as a record store exclusive release back on 4/20/2013. 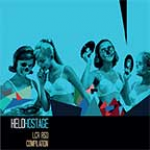 Held Hostage features unreleased tracks by Hex Machine, Seawhores, Cars & Trucks, Dead, Gay Witch Abortion, Hammerhead, Nerves, Ouija Radio, and Gay Whores Skoal Power. Overall, Held Hostage makes for an amazing listen! Highly recommended! Enjoy!